Format: bilingual DVD / 105 min. I can always appreciate a simple story well told. Junkers Come Here was a joy to view, and it offered a nice break from the increased stress of the season and the heavier films I've seen lately. After the Matrix sequels, a tale of a young girl dealing with family problems was more than welcome. Hiromi Nozawa is a relatively impressive young girl. Her father is always away on business, shooting commercials all over the world, and her mother is a high-up employee of a major hotel chain, which forces her to work all day, every day. Despite her parents' frequent absence, Hiromi does very well in school and is very mature for a grade school student. Hiromi is cared for during the day by her housekeeper, Fumie Morita, and tutored by Keisuke Kimura, a college student who boards at Hiromi's house. Her best friend, however, is her dog, Junkers. The interesting thing is, Junkers can talk. As Hiromi's conscience, confidant, and co-conspirator, Junkers is a vital component of the young girl's happiness. 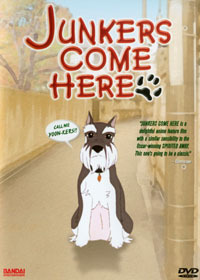 However, the film's charm comes not from the gimmick of a talking dog so much as from the strong character-driven plot. Themes of growing up, handling parental difficulties, and the humor that can be found in daily life are all presented with a straightforward sincerity that is extremely refreshing. While the animation is smooth and believably lifelike, this is not a visually stunning release. The story is more important than the action, and many of the most extreme conventions of anime are not to be found here. There are no incredible scenes of computer generated imagery, there are no over-animated breasts that jiggle like Jell-O in an earthquake, and hairstyles are not impossibly spiked, nor do they represent every color of the rainbow. Oddly enough, this lack of concern for visual pizzazz makes this a unique release. The style is frank and honest, mirroring the plot. Character designs are very solid; the animators get no less of a performance out of their artwork than any other show or film I've seen. Everything may appear simple, but there is power in this simplicity, and boatloads of emotion. I tend to be biased toward the Japanese language track, so it probably won't surprise anyone that I liked that version of the movie more than the English one. Mei Oshitani is terrific as the precocious Hiromi, never becoming too annoying as a little girl. I also greatly enjoyed Shinnosuke Furumoto's portrayal of Junkers. His character's mixture of innocence and wisdom goes well with his soothing voice. The English dub has its ups and downs, though this is certainly an above-average dub. Brittney Wilson provides a surprisingly impressive voice for Hiromi, and Sanders Whiting is equally skillful at bringing Junkers to life. As these are the two main characters, it's a good thing that they sound appropriate in English. However, both Sean Campbell (as Hiromi's father, Shintaro) and Brad Swaile (as Keisuke) present an emotionally confusing performance. It's not the lack of emotion so much as the awkwardly emphasized phrasing that turned me off from their voices. Other characters sounded rather good though, so overall, it remains an impressive dub. The music was written by Naoto Kino, who also happened to write the novel that the film is based on. Much like the other aspects of the movie, the soundtrack is low-key, but strong and steady, adding much to the feel of the film. It's more enjoyable within the context of the movie than without, but it's solid nonetheless. Extras for the disc include an art gallery, a text interview with Naoto Kino, the theatrical trailer, and the short pilot film made before the movie went into production. This is an excellent film for the whole family with rock-solid production values. Not once does the movie try to awe its audience with flashy visuals or an unbelievable story. Instead, it draws us into its simple fantasy world that may actually be our own. Sure, it features a talking dog, but Junkers Come Here remains one of the most realistic and heartfelt stories I've seen in a long time. Perfect for the holidays, it's something I'd recommend to anyone who needs a nice, pleasant story.